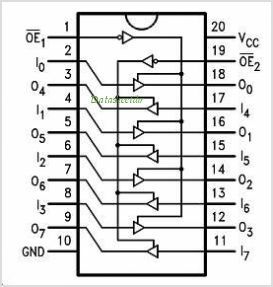 The 74ACTQ244 is an octal Buffer and Line Driver designed to be employed as a memory address driver, Clock Driver and bus oriented transmitter or receiver which provides improved PC board density. The ACQ/ACTQ utilizes Fairchild Quiet Series technology to guarantee quiet output switching and improved dynamic threshold performance. FACT Quiet Series features GTO output control and undershoot corrector in addition to a split ground bus for superior performance. This is one package pinout of 74ACTQ244,If you need more pinouts please download 74ACTQ244's pdf datasheet. 74ACTQ244 circuits will be updated soon..., now you can download the pdf datasheet to check the circuits!